Mahatma Gandhi once said "You must be the change you wish to see in the world." The "spirit of giving" could be felt in everything that we did this month, thanks to our loyal supporters and sponsors. St. Francis Food Pantries and Shelters held our Fourteenth Annual "Doodle For Hunger" Celebrity Art Auction, which featured very special musical guests Gloria Gaynor and Constantine Maroulis. Presented by Margo and John Catsimatidis, "Doodle For Hunger" took place at the beautiful Pier Sixty in Chelsea Piers. With over 800 people in attendance, guests bid on original and signed artwork for charity. This was the first year that the Doodle Auction included musical performances, but, perhaps not the last, as the entertainers truly wowed the crowd! Drawings by the late James Gandolfini, as well as Donatella Versace, Carol Channing, Rex Ryan, Liza Minnelli, Charles Fazzino and Tim Burton were among this year's offerings. The Suzie Reizod Foundation provided us a delightful surprise by donating shoes for the second time. Cynthia Dozier, President of the Foundation provides these shoes as part of their mission to improve the lives of the less fortunate. The recipients of these shoes were adults and children in need within our network. 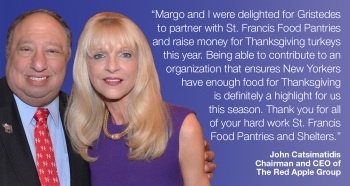 Gristedes Supermarkets, owned by Margo and John Catsimatidis, partnered with us this Thanksgiving to help our goal of providing turkeys to NYC families in need. 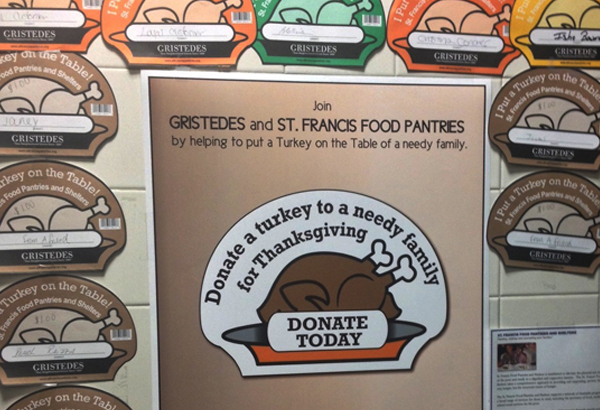 Very colorful St. Francis Food Pantries and Shelters "turkey pin-ups" could be found plastered throughout Gristedes Supermarkets neighborhood locations, as a simple reminder of a meaningful way to give back this season. Who doesn't love an impromptu pizza party? Jones Apparel/Jones New York made this possible by donating over 20 pizza pies so that one of the shelters we support could enjoy a special lunch. St. Francis Food Pantries and Shelters' Turkey Drive 2013 kicked off in late October on a holiday mission to raise and distribute over 5,000 turkeys for deserving families. A festive turkey donation link was featured on our website in addition to use of the hashtag (#StFFPturkeydrive) for an easy way to donate and spread the word! Some of our celebrity supporters even joined in to let everyone know by retweeting and sharing on Twitter. (Search the hashtag to find out whom!) In the end, we were thankful to be able to successfully distribute over 7,000 turkeys and hundreds of cases of food this Thanksgiving! This time of year is always an exciting one, filled with an overwhelming desire to lend a helping hand. November featured many "Peanut Butter and Jelly Sandwich Making Days" sponsored by Polo Ralph Lauren, J.P. Morgan Chase, Merrill Lynch and MetLife. Our PB&J days have increasingly grown in popularity as a hands-on (and nostalgic) way to help others. Volunteers worked together in teams to make over 20,000 sandwiches as part of our "Brown Bag" lunch program! These bagged lunches are all distributed to pantries and shelters in our network. The St. Francis Food Pantries and Shelters "Winter Coat Drive" is in high gear with gift wrapped coat donation boxes in many company office buildings throughout the NYC area. Our aim is to collect over 10,000 coats for our clients and ensure that they stay warm this winter. If you'd like to donate a coat, we c an help you to locate your nearest drop-off location. With the holiday season now in full swing, we can't help but feel so grateful for your unwavering support of our mission. Together we can make the next couple of months truly special for so many people who are without.